Forgiveness frees us to get on with our lives! 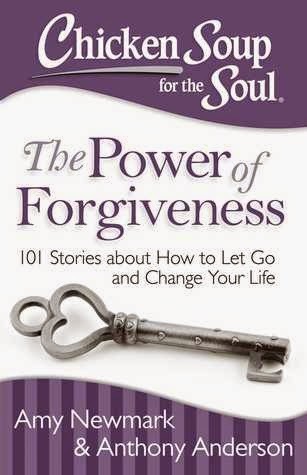 We can all benefit from letting go of our anger, and the 101 personal, touching stories in this collection will help you see the power of forgiveness and how it can change your own life. Whether it's forgiving a major wrong or a minor blunder, forgiving someone is healing and frees you to move on with your life. You don't have to forget or condone what happened, but letting go of your anger improves your well-being and repairs relationships. You will be inspired to change your life through the power of forgiveness as you read the 101 stories in this book about forgiving others, changing your attitude, healing and compassion. With us being into the New Year for almost a month now, this book came to me at just the right time. Starting over, letting go and trying not to stress too much over the little things is one of my new goals for 2015. The book The Power of Forgiveness shares with you many different short stories on ways that others have learned to forgive, let go and move on and how you can do the same thing. Holding on to anger isn't good for anyone, especially you. It can cause so much stress and that wouldn't be good. I love how there are stories in here for anyone who is struggling with forgiving a parent, sibling, friend colleague and most importantly, yourself. As you know I absolutely love Chicken Soup for the Soul books, not only are they inspiring, but they also are great reads that you can take with you anywhere and can finish a few stories in a short amount of time. I love that I can take this book with me to the doctors and by the time I'm done with my appointment I've read a handful of stories. The Chicken Soup for the Soul books are also great gifts to give anyone in your life. There is always a book out there for someone. Disclosure: All opinions are my own. I received Chicken Soup for the Soul: The Power of Forgiveness at no cost for the purpose of this review. No other compensation was received.